A cavity is a hole in the tooth that is caused by bacteria. Decay occurs when plaque (the sticky substance that forms on teeth) combines with the sugars and/or starches of the food we eat. This combination produces acids that attack tooth enamel. 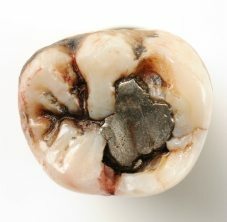 Enamel is the hardest tissue in your body, but by no means indestructible. In fact, enamel is exposed to bacteria all day which produces plaque that eats away at the enamel causing the holes known as cavities. Leaving plaque on your teeth leads to tartar buildup which brushing and flossing alone cannot remove. Letting plaque get out of control can lead to many oral problems ranging from bad breath and cavities to gum recession, periodontal disease and tooth loss. Even teeth with fillings are not immune to plaque. Plaque can damage fillings and other dental work which can lead to future problems. With the exception of some early decalcification, cavities do not fix themselves or disappear. Once a cavity starts, it continues to spread into the deeper parts of the tooth, eventually affecting the pulp leading to nerve damage and even an abscess. In the process, it destroys the tooth structure making the tooth weaker and possibly resulting in a fracture. Early treatment is less painless, less expensive and often preserves the tooth. This is why we often fill small cavities long before they reach a level where they become problematic. Prevention is the key ! The best way to prevent cavities is by brushing twice a day, flossing daily and going to your regular dental check ups. Eating healthy foods and avoiding snacks and drinks that are high in sugar are also ways to prevent decay. Take these simple steps to protect yourself from the damage that plaque can cause and to limit your teeth’s exposure to plaque. Brush your teeth : The bacteria in your mouth produce plaque throughout the day, especially after meals. Make sure you brush your teeth properly (2 minutes) after every meal. Keeping a toothbrush at the office is a great idea. Floss: When you eat, food debris often gets caught between your teeth. If the food debris is not removed, it can lead to cavities. Flossing daily is the best way to remove this debris from between the teeth. Remember to floss before bed. Visit the dentist: Regular check-ups and cleanings are a key factor in preventing cavities since some cavities can only be detected by a dentist or a dental x-ray. Our Toronto dental implants specialist can help you in this. Eat healthy:Proper nutrition plays an important role in good dental health. Eating nutritional snacks and limiting the amount of sugary drinks will help to prevent plaque from forming on the teeth. If you want a sugary snack, have it with a meal. Place sealants:Dental sealants are a protective coating that is applied to the biting surfaces of the back teeth. The sealant protects the tooth from getting a cavity by shielding against bacteria and plaque. Sealants are more common in children because of the new growth of permanent teeth, however, sealants can benefit adults too. Chew gum ! (the sugarless kind): Believe it or not, chewing certain sugarless gums can actually help to prevent cavities by increasing the flow of saliva in your mouth.